One of my late mother-in-law’s favourite possessions! Going through my late mother-in-law’s closets in recent days gave me much pause for thought about how well I knew her. Tim O’Brien’s book, ‘The Things They Carried’ famously uses the idea that we carry with us objects that reflect our characters, our history, our hopes and dreams. How, I wondered, could this be translated into the mountains of old clothes and shoes, the drawers full of old greetings cards and unopened, unused presents, that we were now faced with? I shall never forget pulling back the bedclothes one night to find that my mother-in-law had secreted no less than 17 copies of the Oxford Mail under my duvet, reflective not only of her passionate connection with her home town, but also her paranoid and fierce determination to defy her elder sister, with whom she lived, and who insisted she throw the papers away! This first item stopped even her children in their tracks! It was a shard of stone, slate perhaps, about two feet tall, and welded to an iron base. Onto it were stuck three little figures. They had once been those plastic WW2 toy soldiers, the kind that we played with as kids in the 70s. These were the crawling sniper kind, posed to lie on their bellies, arms above their heads told hold their rifles, one knee crooked to steady the body. With the gun trimmed away, and their clothing and faces painted brightly, even down to the helmets daubed with bright orange, they had been stuck to the side of the stone at different stages up the rock. Sewing thread delicately strung between the figures stood in for climbing rope. It was a DIY representation of men climbing a Welsh cliff face, and I know it was Welsh because the base wore a sticker from a rural art gallery in Mid Wales. Now, I should point out that neither my mother-in-law, nor her sister, nor anyone else in the family that I know of, ever went on a climbing expedition, nor had any interest in doing so. I’m not even sure that my mother-in-law ever visited Wales. I cannot for the life of me work out why she would have owned such a thing, or how she could have acquired it. Or what she planned to do with it, having done so. It is clearly old, probably some thirty years or so, so significantly predates the Alzheimers. Quite apart from the fact that it is truly hideous, despite the ingenuity of its maker, why would you want such a thing? And what would you do with it? If you lived in the UK in the mid 1990s, you will remember Billy Bass because every gift shop sold them. He consists of a ‘wooden’ plaque, on which is mounted a plastic fish. When you press the button on the bottom, and if you’ve put the batteries in the right way around, the fish will flap its head and tail, open its mouth, and sing a crackly tune. Don’t ask me what the song is, I can’t remember – clearly, my mind has blocked it out! But my mother-in-law loved it. She would carry it around the house with her, playing it, coming up behind your back and setting it off suddenly to make you jump, bringing it out at every social occasion. It was the epitome of her completely silly sense of humour, an object that perfectly described her character, and finding it brought back so many memories of happier times. Buried deep amongst worn out sweaters and cardigans at the bottom of a drawer, my sister-in-law and I came across something deeply poignant, something we never thought we’d find. A handmade Edwardian christening gown, beautifully decorated with drawn-threadwork and bobbin lace. With it was a matching undergarment, sleeveless, with the same long, lace-edged skirts. The gown itself had long bell sleeves edged with the most delicate lace. Both were made in the finest cotton lawn, carefully washed and pressed. And with them, a cream silk christening coat (for want of a better word – I have to confess I’ve never seen a garment like it), with a ruffled collar and yoke, frills on the little cuffs, and a deep frill around the bottom hem. The silk is so soft, and of such a high quality, that it slithers through your fingers like water. We can only assume that the cotton garments were the ones in which my husband and his brother were christened. Family heirlooms no doubt. They certainly look very similar to the one christening photo we’ve managed to find. But not the silk one. We don’t know where that comes from. My mother-in-law never had grandchildren. I was too ill, and my sister-in-law was the successful headteacher of a string of large secondary schools in London, and had enough kids at work to satisfy any mothering instinct she might have harboured. Were these items bought or kept from the long held and never fulfilled desire for grandchildren? If she harboured such feelings, my mother-in-law never spoke of them. She never pressured us. But I found it deeply sad to find these little whispers of ‘what might have been’ treasured amongst her belongings. These three items – the one that described her perfectly, the one that showed a deeply buried longing, and the one that seems so disconnected from who she was – say something significant about who my mother-in-law was. Something the mound of nearly 400 garments we went through could not. Each demonstrates an aspect of the life she lived and loved, where she lived that life, and the family and friends amongst whom she dwelt. Then choose three items they own. One should be something which they might hide away, which represents for them a secretly cherished longing. (The christening gowns.) What is their dream? Why must they hide it? And one should be the complete antithesis of everything you know about them. (The Climbers.) Why do they own it? How did it come into their possession? What did they do with it? Write about your character through each of these three objects. This entry was posted in character, creativity heals, Enrich your writing skills, fiction, My Life, Notebooking, Writing, Writing Exercises and tagged character, Writing, writing exercise on 05.04.17 by evenlode1967. Its all a bit pre-Christmas mental here, and its possible you are feeling the same way, so lets share a little time avoiding writing those cards, shall we? Lately I’ve been collecting words. Isn’t that just a marvellous way to describe an old man’s face? Words I hadn’t really thought about in years, though I knew the meanings. Words that are nice to roll around on your tongue. Words that pop like red roses in your paragraphs. As you voyage through the festive season, why not make a list of the interesting words you come across. Its not a hard or time-consuming thing to do – I scribble mine on the scrappy little pad of paper I keep by my bed for the purposes of writing to do lists and things I have to remember in the morning. Then I transfer them to the back page of my writing notebook when I have a moment to spare. Easily done. I’ve got a bit of a passion for F words at the moment, as you can see! They don’t have to be on a theme or for a reason. I collect them only because they appeal to me. They sing out from the page. 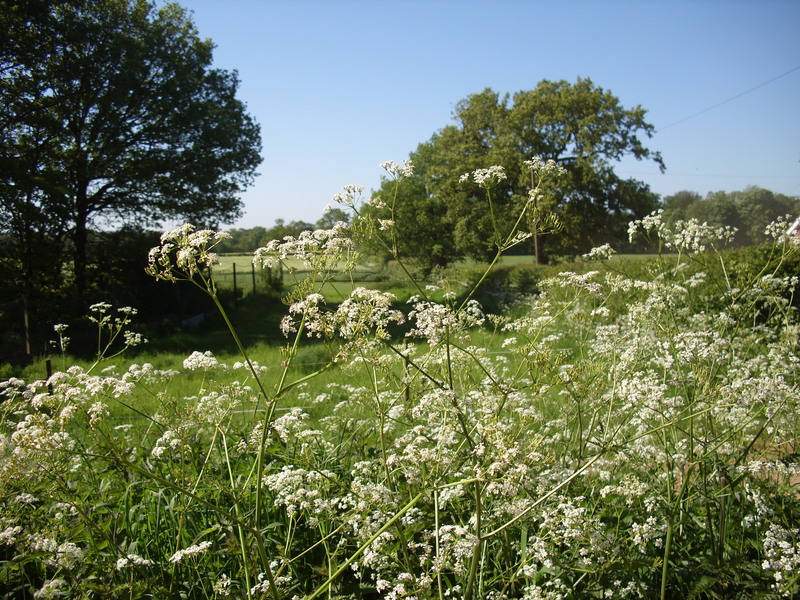 Now I’ve got a growing resource for making my writing interesting and alluring – I’ve written a little about this before, and I’m coming back to it. I’m thinking about creating a kind of utilitarian type prose, a la Hemingway, but studded with jewels of unusual and seductive words. 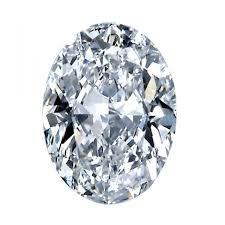 So, why not see what little jewels you can dig up? This entry was posted in Choosing the right words, Dictionary, Enrich your writing skills, fiction, Language, Notebook, Notebooking, reading, Vocabulary, Writing and tagged Creativity, Fiction, have fun with language, language, prose, vocabulary, Writing on 17.12.14 by evenlode1967. 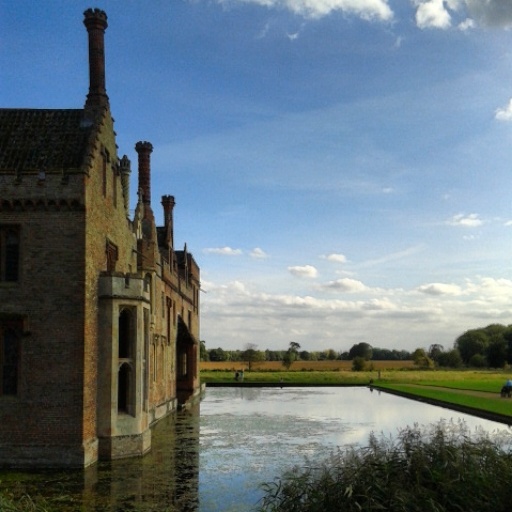 As a special treat last weekend, Husband took me to visit a local National Trust property, Oxburgh Hall. 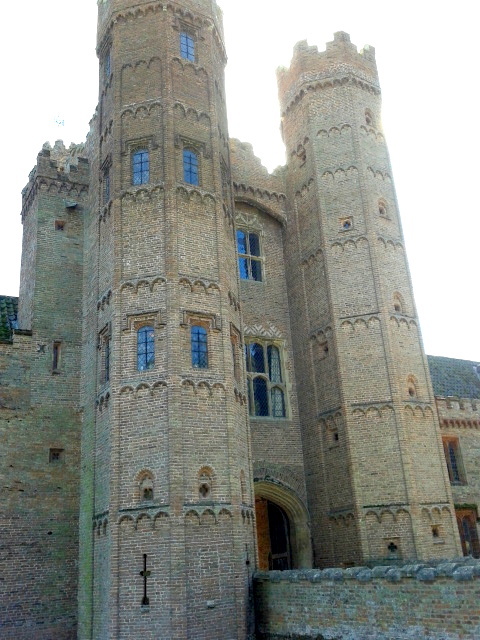 Built about 1482, Oxburgh was the home of a well-connected family who hung onto their Catholic faith throughout a period in English history when it was dangerous to dissent from the religious line the Crown laid down. 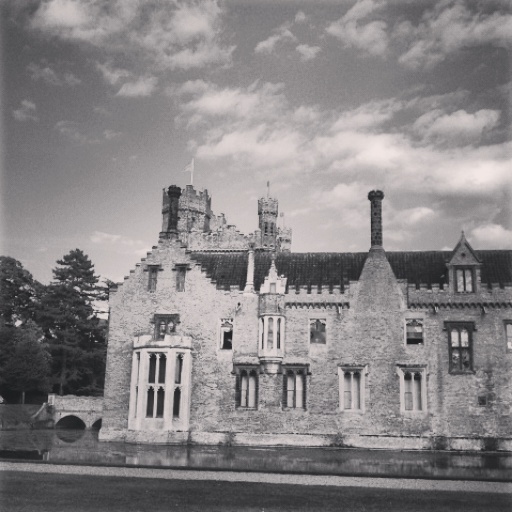 Oxburgh’s inhabitants suffered as a result, passed over for lucrative posts at Court, closely watched for sedition and treason, and restricted from certain occupations as well as from celebrating their religion openly. The result of this (relative) penury is that the building escaped the zealous passion for updating property that characterised the aristocracy, and many of its original features remain intact, including the King’s Room and the Queen’s Room, authentic Tudor bedchambers in the tower house that spent many years used only as storage spaces! Oxburgh appears to float on its moat, which cannot be drained as the 500-year-old elm wood posts which support the foundations would crumble were they to dry out. It still has the barleysugar chimneys and characteristic towered gatehouse that recalls the Wars of the Roses. Inside the sombre portraits of nuns, the needlework sewn by Mary, Queen of Scots in her years of captivity, and the Priest Hole, where illegal Catholic priests had to hide from government troops, speak of a dark history of dissent and risk, of members of the family living in fear for their lives, simply because of their religious beliefs. Oxburgh was a particular target during both the Reformation and the Civil War. And yet, despite this, the little rowing boat that floats beside the steps on the moat is named ‘Le Boat sur le Moat’, so the family still kept their sense of humour! I started wondering what it would be like to live through that? Never to be able to trust your neighbours, your servants, even your family? To live constantly in the shadow of the block? To live in fear of the next knock on the door? To question your beliefs every day because they challenge your personal safety and that of those you love? To always be regarded as ‘Other’? The history around us gives us an opportunity to look at our own lives through a different lens. What happened in England in the 15- and 1600s is not really much different to what is happening in parts of the world now. Being inside a building where these things happened, seeing and touching the belongings of people who lives through such terrifying times, brings the realities home in a much more deeply felt way. If we do not live under such stresses ourselves, we can never truly understand what they mean, but we can imagine. I live in a house that was built in the 1880s. Its just a little country cottage, the middle one of a row, the kind that are common in the UK. It was originally built as two houses, one up-one down dwellings with an outside wash house, coal hole and privy each. The men who lived here worked for the local Lord as farm workers or gamekeepers, and got the house as part of the deal. Their women kept the house, cooked the meals, raised the children, and spread their washing out on the pasture behind the houses to dry on wash day every week. The children would have walked across the fields to school each weekday, and worked alongside their parents when they got home. They would have worshipped at the medieval parish church whose tower can be seen from our livingroom. How different the lives of those souls would have been from mine. Think about historic buildings and places near where you live. try to visit one or two if you can. They don’t have to be as old as Oxburgh to count. What about a coffee shop built in the 1930s, during the Depression, or a 1950s diner? Take some time to soak up the place. Think about the people who have lived and worked there. How would the community have reacted or been affected when the building was put up? They might have had to sacrifice their own land or homes, for instance, or they might have objected on moral or economic grounds. How would it have felt to visit this place in those days? What kind of day to day issues would have been on the minds of those who lived here? What stories are concealed in their lives? Take some time to write a few pages, answering these questions. It doesn’t have to be historically accurate, but it helps. Use the building or place as an entrance into someone else’s life and see where it takes you. This entry was posted in Architecture, character, Enrich your writing skills, History, ideas, Inspiration, Inspiration Monday, Landscapes, Notebook, Notebooking, The Creative Process, Writing and tagged Creativity, history, Inspiration, National Trust, Oxburgh, Tudors, Writing on 01.10.14 by evenlode1967. The other day, a friend challenged me on Facebook to name the top ten books that had most influenced me in life. It was one of those things where you give your list, and then challenge your other friends. But how the hell do you choose, especially as the challenge specifies you do it off the top of the head, without thinking too hard, as fast as possible. How do you choose only ten books out of all the great novels and stories you have read over a lifetime? My list was visceral, and based largely on what I read when I was younger. I thought about the books that had made me happiest, that I have gone back to over and over again in the course of my life. And it was interesting just to reflect on my criteria for choosing, as much as anything. I ended up with about 15 that didn’t quite make the grade, and if I think too hard about it, I would definitely shift a few from one list to the other. I mean, how do you choose which Terry Pratchett? The above was my original choice, and I think I’ll stand by it. And then I challenged other friends. And like Japanese knotweed, lists of novels and non-fiction books blossomed out all over. Everyone had a fascinating new combination of books they raved about. Many, like Sebastian Faulkes’ ‘Birdsong’ and Camus’s ‘The Plague’, were held in common. Lots of lists were biased towards ‘we did that one at school’ books. I marvelled at the wide range of stories that had influenced my friends. And I felt like I had barely read anything worth reading since I left college. I suppose this is understandable. When you see a list of books, you always look for the familiar ones. And if the ones you have read are in the minority, you feel like a fool for not having read the others. Especially the significant ones. On the other hand, who the hell has read the whole of Proust’s ‘Remembrance of Things Past’, or ‘War and Peace’? (I have to say I was impressed by the number of people who had read Dostoyevsky’s ‘Crime and Punishment’. Kudos! It is one of the basic pillars of the Craft. And you have to read the good stuff as well as the commercial, otherwise you never improve. Making this list made me realise how little decent fiction I have read in recent months. Time to get back to it. I need to do the same again. This morning I found myself in a bookshop, gazing longingly at table after table of lovely crisp new novels. (It’s the time of year that provokes me – September draws me into bookshops still, an echo of student days of joyful bookbuying with a free conscience!) But I was good. I left the books uncaressed. 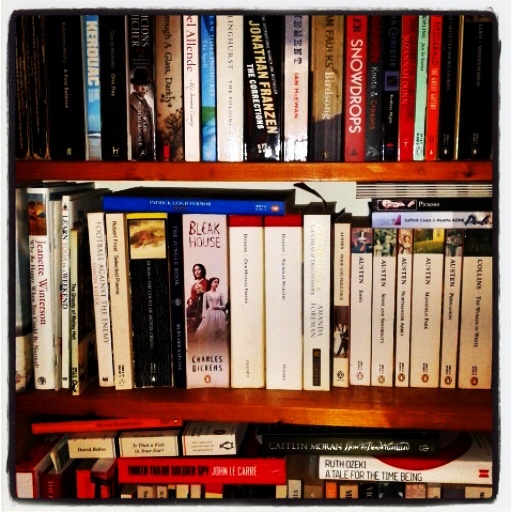 I have piles of unread novels at home, you see, amongst them ‘Birdsong’, along with Tim O’Brien’s ‘The Things They Carried’, Jonothan Franzen’s ‘The Corrections’, and dozens of others, all highly recommended as quality fiction for the budding writer, and all gathering dust on the shelf. No point in buying new ones until I have ploughed through the old ones. So I will cut a strip of paper and write a list of the books in my pile on it. And then I will begin. And each time I close the back cover a book and sigh with completion, I shall draw a careful line through the title and pick up the next. This entry was posted in Books, core practices, Enrich your writing skills, fiction, Lists, My Life, novels, reading, Virginia Woolf, Writing and tagged books, Creativity, Fiction, my fanfics, Reading, Virginia Woolf, Writing on 17.09.14 by evenlode1967. I’ve been trying to find the best way to keep a writing notebook for the last year. And by ‘right’, I don’t mean correct, I mean the system that works best for me. I always used to keep all my notes in an A4 ringbound PukkaPad notebook, the hardback kind. I loved it. There was plenty of room on the big pages, and PukkaPad’s paper is beautifully smooth and takes ink perfectly. Their products are especially good for Morning Pages, because you can write quickly and smoothly on them. This was fine as far as it went, but the book was too big to carry around with me easily, which meant that I tended only used it at my desk. And that meant I wasn’t noting down all the ideas I had, just the few I had when I was thinking about it. Which meant I was always trying to remember what I had thought about. And that meant, of course, that 75% of the ideas I had went AWOL. What a waste. Last September, I decided I was going to get serious about my writing practise, and that meant reflecting on my notebooking habits. This was not a flattering experience. I restarted with a cheap hardback A5 notebook, because it had to be sturdy to withstand being knocked about in my handbag. I just bought the cheapest I could find because I figured it was an experiment, and it didn’t have to be perfect. Plus, if it was too nice, I wouldn’t use it. So decorated the cover so it looked like a more expensive one I was coveting at the time, and away I went. It was really hard at first, making sure I scribbled down the thoughts I had when I had them, not trying to save them up. I added quotes I came across, stories I heard on the bus or on the radio, and took notes in book talks I went to. And I quickly filled up my scrappy little book. And once it was full, I forgot about it. So when I got the bug again, deciding to renew my commitment to my work, I made the mistake of going off to gorge myself on the goodies at Staples. Gods, I love Staples! The ARC discbound notebook system from Staples. The one on the left is a cover I made myself. And there I fell in love with the ARC discbound system. I came home with a beautiful leatherbound A5 notebook. And it is gorgeous. You have no idea. 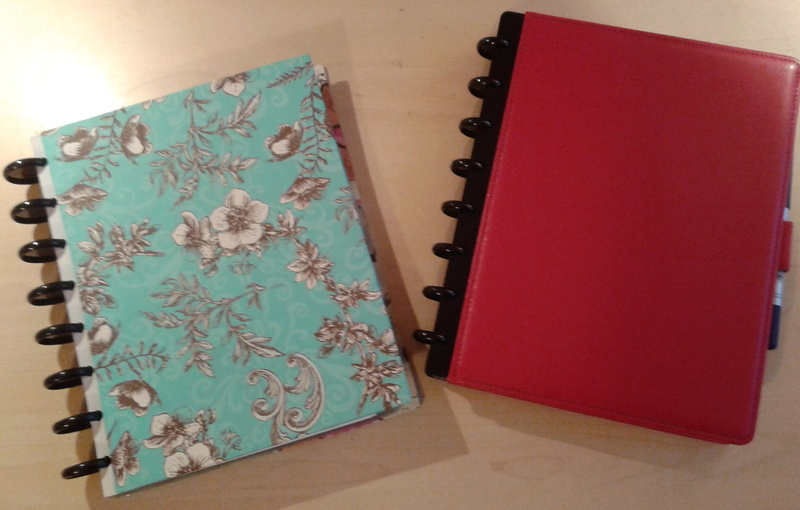 And because its discbound, I decided I would combine my notebooking with a blog planner. I printed out pages and punched then and fitted them in and moved them about. And my lovely ARC planner became so big and heavy that I couldn’t get it in my handbag. Which rather defeated the object. And the thing with the lovely leather binding is that you can’t just throw the book in the back of the drawer to await later pillaging for ideas. You feel duty-bound to keep using it. So you have to take the contents out, and then what do you do with them? 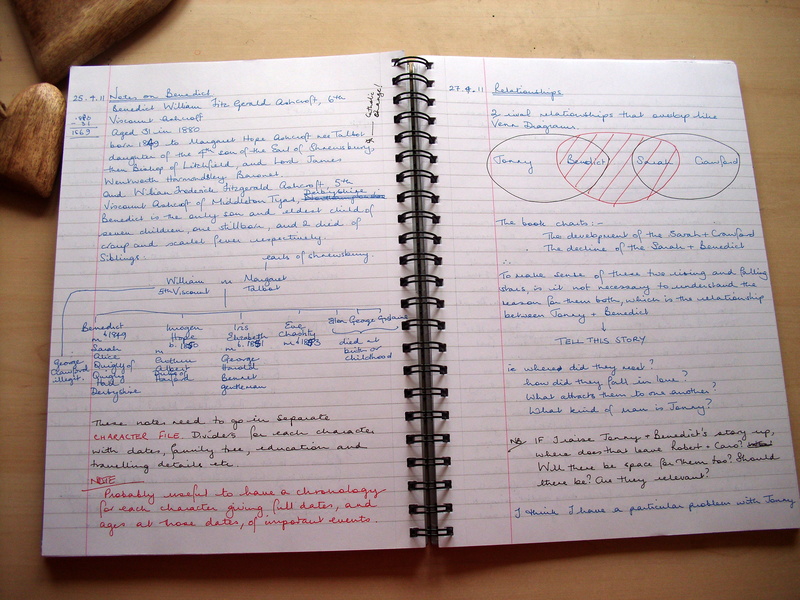 So the ARC notebook, no matter how delectable, was a notebooking disaster. An A5 notebook to fit in my handbag. A pen loop would be useful. Nothing too fancy, or I won’t write in it. Nice paper is an incentive. So back to Staples I went. And this time I came home with the A5 version of the Oxford notebook. It has a stiff plastic cover and is spiral bound, which means I can fold it flat over easily. Its got lovely paper. I can tuck a biro into the spiral binding and it acts as a pen loop. It is satisfyingly thick but the smallish size means I can fill it quickly, which pleases me and makes me feel like I’m making progress. And I am using it. Every day. Filling it with thoughts and ideas and potential stories and snippets and all kinds of goodies that I know I can rummage through in future. I’m even using it to write bits of stories and dialogue for my fanfics, and bits of diary-like reflection on the writing process for my novel. It goes with me everywhere, my little friend. And it is still evolving. I could probably write another post along the same lines as this one in six months’ time, and I’ll probably tell you something completely different. I think the notebooking requirements you have change with you as you go on in the craft. But for me, this is where I am now, and I think I have finally found a way to record my brain on paper in a meaningful and useful way. I encourage you to explore using a writers notebook if you write, but to do it, too if you pursue any other kind of creative art. A sketchbook for an artist fulfils the same function. It allows you to explore your creative interior, push the boundaries of your ideas. Its useful to keep a little notebook in your pocket or bag just to scribble down random ideas and thoughts you have, regardless of what art you do. Be gentle with yourself as you find out what works best for you. From little cardboard-bound exercise books to luxurious Paperblanks, there will be something that fits your life. Think about your lifestyle and what your requirements are. I recommend that you start cheap so you feel like you can make mistakes. There is no wrong or right. Its just what works best for you. You just have to find it. If you want a beginners guide to keeping a writers notebook, click here. I’ll no doubt have lots more to say on the subject in coming posts. This entry was posted in core practices, Creativity, Enrich your writing skills, ideas, Learning the Craft, Notebook, Notebooking, On Process, The Creative Process, Writing, Writing Every Day and tagged Creativity, Fiction, notebooking, Oxford notebooks, pukka pads, stationery, writers notebook, Writing, writing practise on 09.07.14 by evenlode1967.